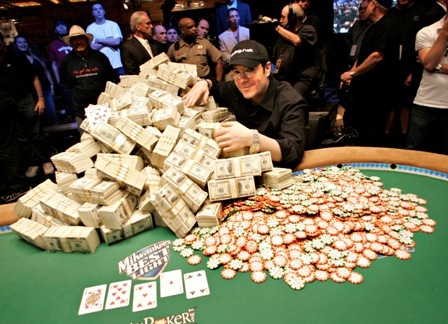 Aspects of Play: Games Research, Poker. Poker is probably the most popular card game there is, it originates from New Orleans and the Mississippi riverboats of the mid 1800’s and today it is played all over the world either around the dining table, in casino’s, on the internet and in multi-million dollar televised tournaments. Poker fits into three of Caillois’ game categories, the first of which is Alea (chance) as it is pure chance or luck of the draw, what cards the players are dealt and depending upon which variant of poker is being played what cards are in the ‘community’. Agon is also a category that Poker fits into as the players in a game of Poker are competing against each other to obtain the highest possible hand. An element of Mimicry or role playing could also be considered with in a game of Poker, when a player receives a particularly good or bad hand they wont want the other players to see a facial expression that may reveal their joy or disgust, this is where a good ‘Poker Face’ is required to enable the player to bluff if the wish to. A good state of flow can be experienced whilst play Poker as a good amount of skill is required (knowledge of hands) and depending upon your opponents a varied amount of challenge can be expected. Swedish Armed Forces Recruitment Campaign. The Swedish Armed Forces has an online game that is also acts as a test to see if you are mentally strong enough to consider becoming an officer. The game poses various mental challenges that are designed to test four key areas, these are multi-tasking, spatial thinking, memory and concentration. The tests are presented both visually and via a person asking you some of the questions. This game falls in to the Agon and Ilinx categories of game as theorized by Roger Caillois. Multi-tasking is the first test and is quite disorientating, you have to keep the red dot within the rotating grey area while answering maths questions on your keyboard while also pressing the space bar every time a red dot is displayed within the white circle. The spatial thinking test consists of shape arrangement and three dimensional shape awareness. In the memory test a selection of numbers are read out and displayed on screen, the player is then asked to recite the sequence forward at first and then backwards. Then six tiles showing various coloured shapes are shown, these are turned so you see the blank side and you are asked to pick the tile containing what the narrator asks for. The concentration section of the test asks the player to pick out words spoken to them from a word-search then are asked to keep two crossed lines within a circle using the mouse, up and down controls the horizontal line and left and right control the vertical line.